When we first looked at our house, about two and half years ago, I knew what I would do with the front room that the former owner was using as a formal living room. as soon as I walked in the front door. Located right off of the foyer, it was the perfect spot to become our home office! But, first I had to remove the pink carpet (yes, pink), lavender walls and outdated window treatments that were left behind when the seller moved out. We painted the walls, (Sherwin Williams Accessible Beige), removed the window treatments and replaced the carpeting with new hardwood floors (stained with Minwax Special Walnut). I placed much of the office furniture from our previous home in here until I could get to the makeover of this room. BUT – the total transformation of the space would have to wait. Given that we gave this house a total remodel (from top to bottom),the completion of this room was not at the top of our priority list. We lived with it like this for about a year or so. THEN, I made my first decorating mistake in this room. We had so many irons in the fire….so many rooms to complete…that I let my impatience get the best of me. I purchased two chairs just because they were a really great price. I loved the chairs (and still do! ), but they’re currently living in another room that’s waiting for its makeover. I’ll either use them in there or pass them along to my step-daughter when she’s ready for more furniture. After the purchase of the chairs, I realized that I was going about things all wrong! I needed to come to a decision about the direction I wanted to go with the whole house. Annnd…this is a big one…I needed to focus on one.room.at.a.time. The direction/vision was an easy one for me. 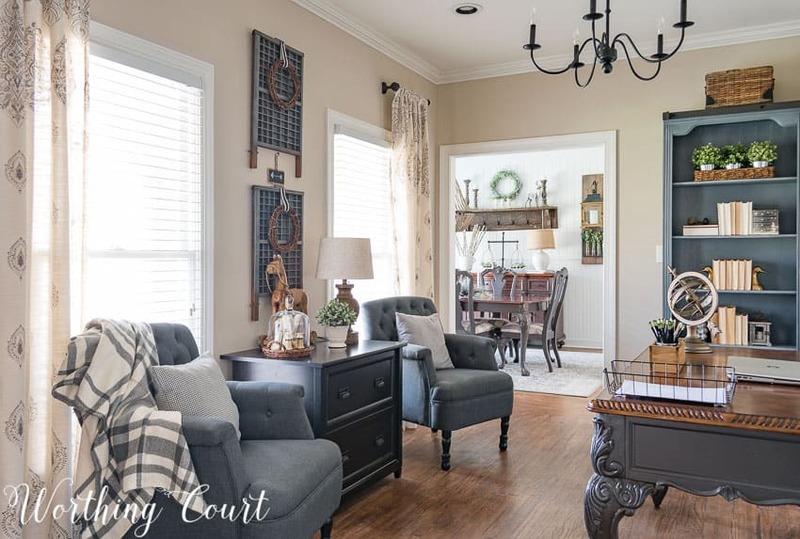 I was in love with farmhouse style and knew that I wanted to emulate that look in my home, except with my own stamp on it. So, in comparison to all of the floundering around I had been doing, once I made the decision to complete one room before moving on to another, the makeover of the my family room, breakfast area and dining room was completed! Then – it was time to get started in the office! I began by replacing the two mistake-purchase chairs with two tufted back gray ones. The starburst mirror was replaced with vintage printer’s trays and drapery panels (from HomeGoods) were added to each window. The drapery panels help to frame out the whole wall. I loved what I had done to my dining room table so much, that I copied the same idea on the legs on the desk by painting them, but leaving the top in its original state. Not too long after that, I completed what is hands-down my favorite project in the whole room – the total transformation of our cheapo, traditional, cherry bookcases into a farmhouse thing of beauty! You can see the before and read about how this transformation was made HERE. I continued the planking from the wall in the dining room onto the wall behind the desk, except that we only took it a little more than halfway up the wall and topped it with a small piece of trim. You can read about how we added the planking to wall HERE. 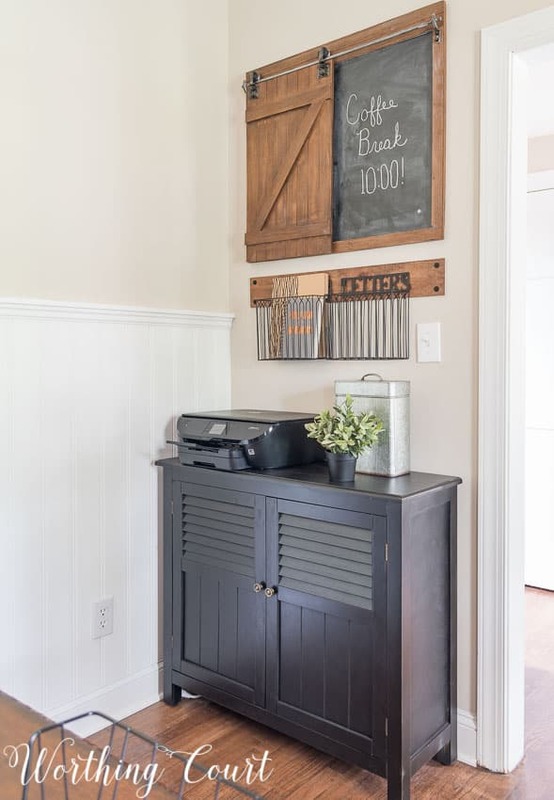 On the opposite end of the room, I came up with a farmhouse style office storage solution and some rustic/industrial wall decor. This corner of the room was truly a hot mess before! The last big decision to be made was what in the world to do on the big blank wall behind the desk. 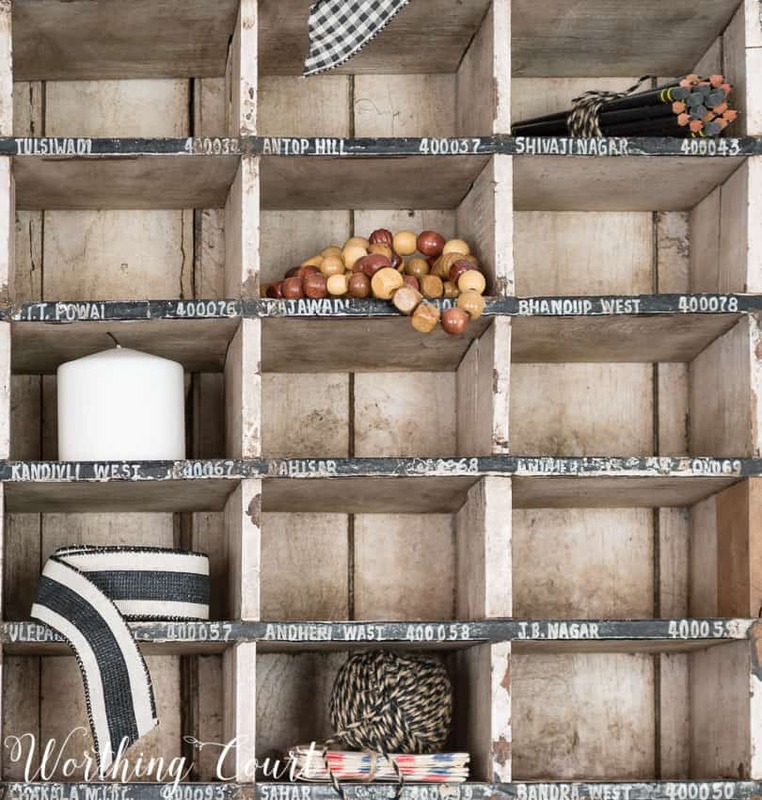 I had a idea that I was mulling over, but couldn’t make myself fall in love with it and then…THEN – I stumbled across an antique mail sorter at a barn sale! Be still my heart. It’s heavy and huge and just what this wall needed. My pictures just don’t do it justice. I have it filled with all sorts of little goodies, but I left a lot of the cubbies empty. I love that you can still see what I assume are street names. I wish that I had asked where the sorter came from. My brother and sis-in-law became all choked up when I explained to them that those airmail letters were written by him when he was in Vietnam. And yes, that’s the real deal grunge. I cleaned it up, but the grunge stayed and I wasn’t about the scrub it off and destroy that patina! The last component that I felt the space needed was a chandelier. I had been saving the original light fixture that came out of my breakfast area for just such a spot! All it needed was a few coats of black spray paint and to have the cage thingy on the bottom replaced with a wooden ball, that I attached with hot glue. The cage piece simply unscrewed from the bottom of the light fixture. Here’s what it looked like before – forgive the blurry photo. Once my electrician installed it, the office makeover was complete and we couldn’t be more pleased with how the room turned out! 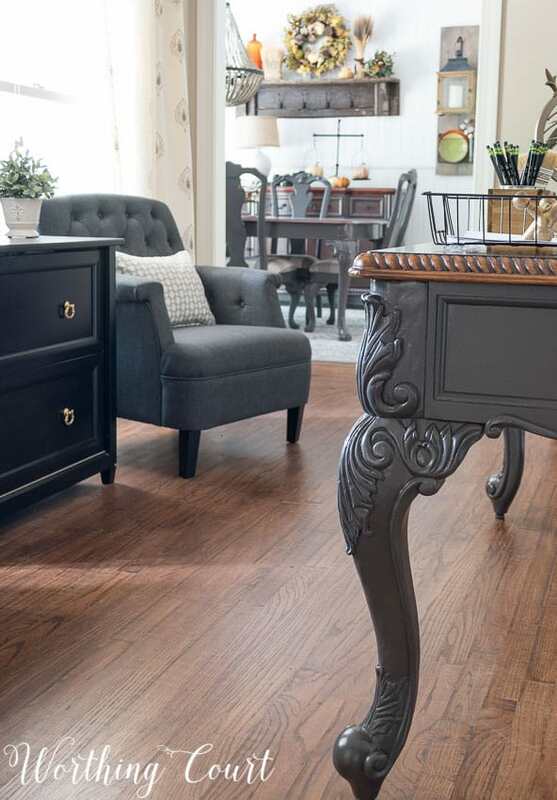 Next on the makeover list – the foyer! Wow! What an awesome room! And, that mail sorter! The stories it could tell. Great transformation. I couldn’t agree more, when I saw that I realized that was the real treasure in the room. Love it! The color choice is perfect! Nice job! Truly inspirational! I have a Queen Anne dining room table and chairs that I would like to transform to fit in my old farm house. 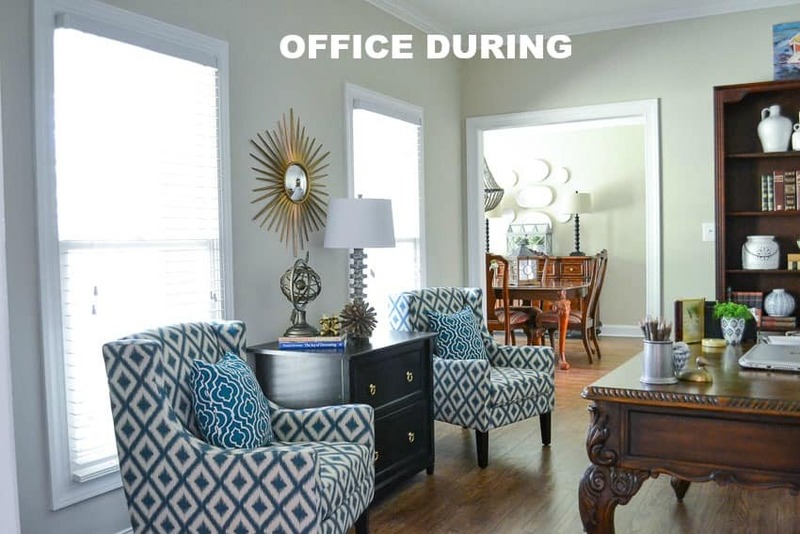 Please share the paint brand and color that you used in your dining room and office. Beautiful! Your rooms always have a designers touch! Thank you for sharing. 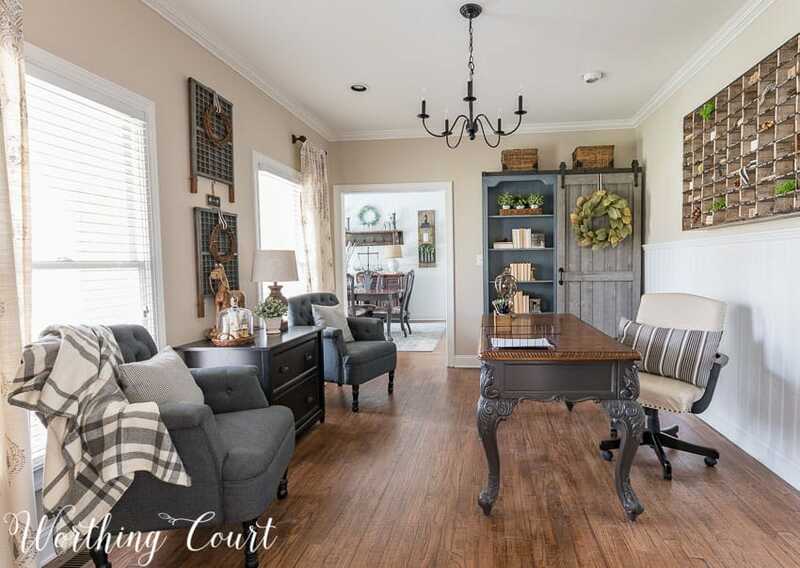 Love how the room maintains a traditional feel with personal farmhouse style touches. I like the chalk board with the sliding door. I saw one at Hobby Lobby yesterday and didn’t know what I would do with it. Now I have an idea. I LOVE everything about this room! You did a great job. Thanks for sharing with us. What a beautiful room!Love everything you did! Such a truly inspiring makeover and room! I have to ask this though. Are the books just decorating pieces or do you have a secret in identifying them for practical use? I’d like to incorporate the look, but we actually read ours.??? Hi Deb. In this case, my books are just for decorating. I picked almost all of them up on the cheap at thrift stores, just to decorate with. 😀 The only thing that I can think of is to cover the books with neutral paper or fabric and then write the title of the book on the spine with a marker. That would give you the neutral look, but you’d still know what each book is. Love every detail of the room. Especially in love with the look you gave the book shelf with the sliding barn door. Great idea. Relooking at your kitchen remodel and wondered where you purchased the runner in the kitchen. Thank you. I love what you have done, but I am not brave enough to paint my cherry and mahogany furniture. Love, love, love everything about this room. Any time spent in this room doing office work wouldn’t be work at all. 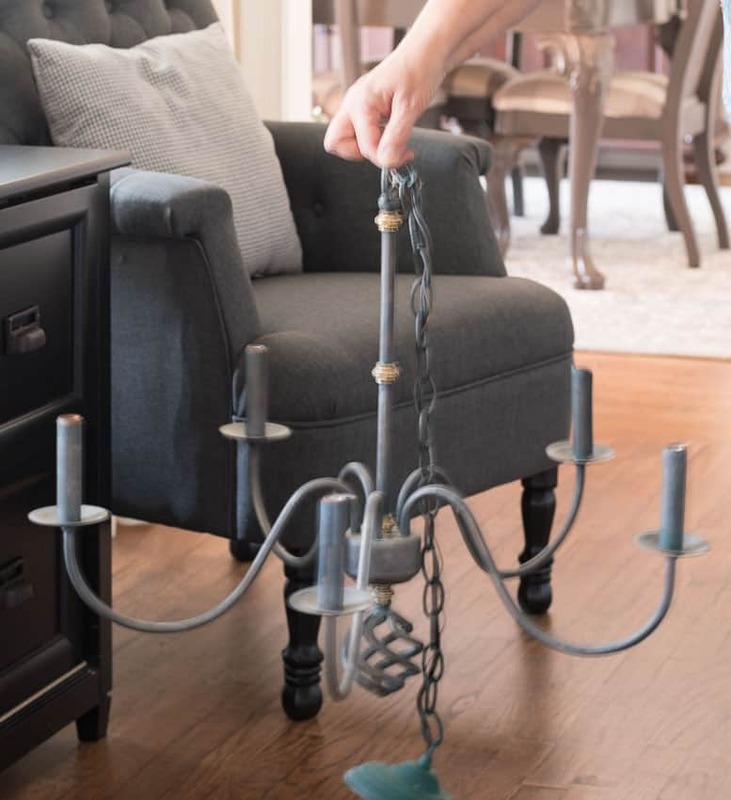 Do you think the light fixture would be a good choice above my island and dining room table. Love the fixture !! You have created such a lovely and warm room to have for your office. I love all of your decor choices, especially what you have hung on the walls – an area which always causes me stress because I can never make a decision. The mail sorter is absolute perfection for that wall! I love all of the redesigning you have done to your home, but your office is my favorite. 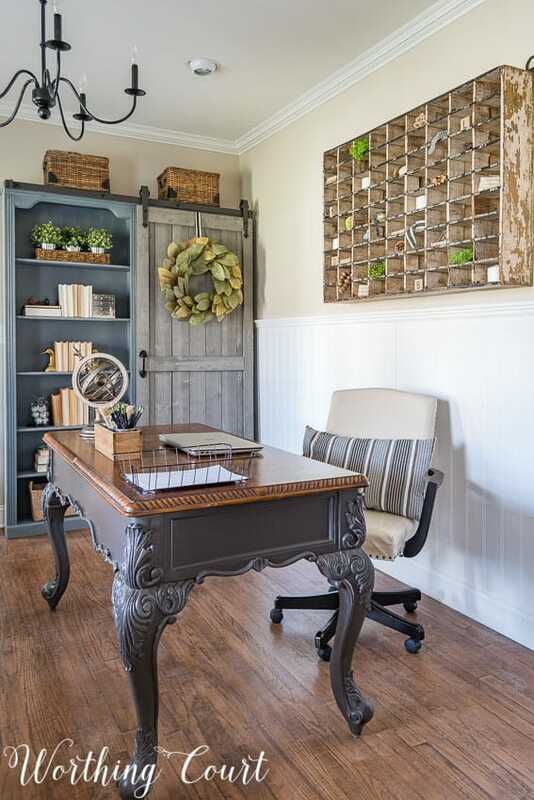 The desk is gorgeous and that bookcase with the barn door, the best ever! This is such a gorgeous space. I love it. Love your office. Beautiful job. I’m curious though because I missed the connection of the airmail letters your brother wrote. Did you find them in the mail sorter? Hi Starr. The mail sorter was empty when I bought it. I found the letters that my brother wrote in a box with some old family stuff. I wanted to also use letters that my dad had written during WWII, but they wouldn’t fit it the cubbies. great transformation. I love the color scheme. This is my favorite blog….Just love your style and the many transformations in your home…What will you do when you are finished???? Great transformation. You really thought this project through. One needs to thoroughly think about each specific area before moving on. I love your chairs. The room is lovely! Thank you for the advice to do one room at a time. I just moved into a new build home. It’s nice to have a clean slate to work with as well as design elements I chose but I’m overwhelmed with all that it needs. So thanks I’ll concentrate on one room at a time. I’ll take it slow and I’m sure the right things will come along. Just like your mail sorter did! It’s gorgeous Suzy. Love that piece behind the desk. What a transformation! Love your style! 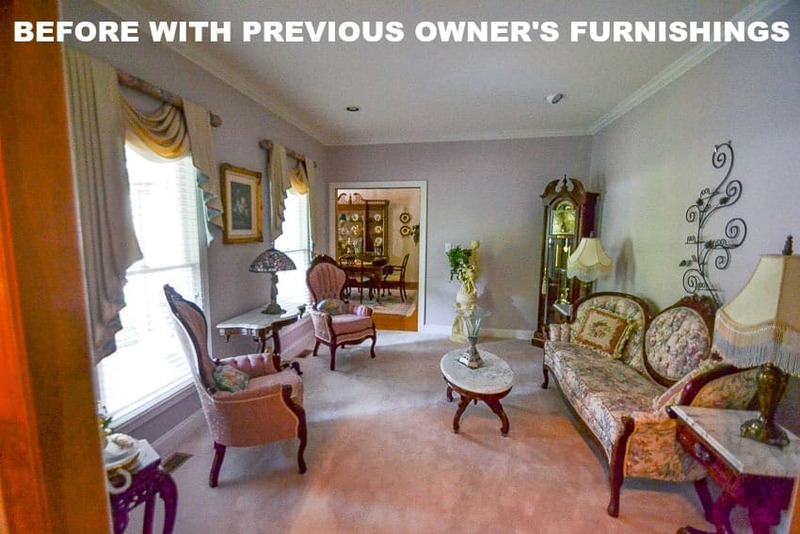 Can’t believe the transformation – the Living Room we never used – I had one too. Before we moved into our condo we made our living room into my husbands office, much needed space for him since he worked from home. Your space is just wonderful – I would love working from a spot like that. Lovely! Your rooms always look so cozy and inviting! I’m going to have to get to hobby lobby for one of the chalkboards! Where do you get that handsome horse? He’s amazing! Oh…this bring back such memories! when I was a child my Dad (a professor) had an old post office mail sorter that he kept his research notes in-it was filled with hundreds of his handwritten index cards. Wish so much I had that old wooden post office box now. i so love what you did with that room! the mail sorter made me gasp and i had instant lust for that thing…were you ever blessed to find that. i love how you also did the printer’s racks, with the wreath over the part of one. this is a spectacular room. it’s perfect. Your transformation of that room is amazing! I love the mail sorter, it’s chippy old look is one of my favorites. You really have made a HUGE difference in your home! Great job! Still a little modern for my taste but love the blue slate gray colors and great job on bookcase! I love it! You did such a great job. I especially love the way that you transformed your bookcase with your homemade sliding barn door. It is beautiful. I love your style! Love the transformation and all of the great decorating ideas that you incorporated!! I really love the mail sorter….what great find!! Thanks for sharing…. Blessin! Love how your office turned out. My favorite part of the room….the mail antique mail sorter. I would not have passed it up either!! I love your office! I have a desk (that belonged to my FIL) that I want to paint – if I can just talk my husband into it! Thanks for the inspiration, Suzy! Your office looks wonderful… and I LOVE the mail sorter, too! Awesome makeover! Love the rich colors and rustic decor. I love the gray on the desk with the natural wood on the top. I’m a big believer in leaving natural wood grain visible IF you have a really nice piece made from solid hardwood. But, I do like the gray on the sides and the legs for contrast. Love the gray chairs, too! The whole room looks great! Love, love, love your office! I especially love the cubbies on the wall behind the desk. Looks quite relaxing! Thank you for sharing, it all looks so lovely! The bookcase makeover is one of my favorite projects you’ve done., but that ,ail sorter is the cherry on top!! It is awesome, and you’re right pictures don’t do it justice!!! Not do they do justice to the bookshelves. Love it , love it, love it!!!! Love it, love it, love it!!!! The bookcase makeover is one of my favorite projects of your s, but that mail sorted is the cherry on top!!! Pictures don’t do justice of either one!!! Where do you store files? In the two drawer across from the desk? Hi Jill. Yes, that’s a two drawer lateral file across from the desk, so that’s where we store all of our files. Love love love your ideas !!! Love the sliding barn door on the bookcase. Unique! Beautiful transformation ! Great transformation! I appreciate that you don’t buy all new furniture for your makeovers, but take what you have and adapt it. That provides more practical ideas for the average person. Love this office! Love the bookcase idea, love the colors! Well, guess I just LOVE it ALL. Suzy, I LOVE everything about this room. Amazing what it did to just paint the legs on that desk, and your bookshelves and that post office cubby are fabulous. So much inspiration in this room. Suzy, First let me thank you for inviting us into your home and sharing your beautiful ideas with us. You did a fabulous job with the makeover and the room is so warm and inviting. 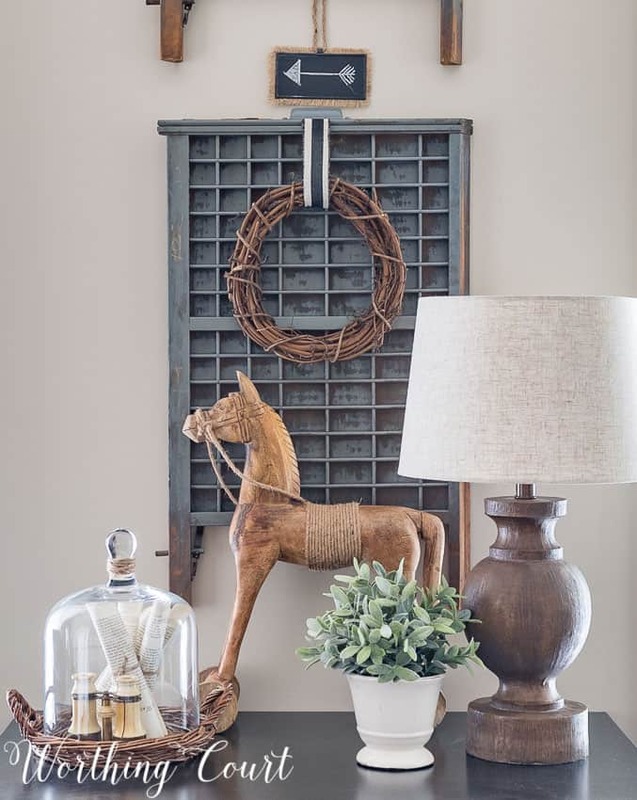 I must admit that I am coveting that gorgeous vignette with the wooden horse! As an academic librarian, I felt obligated to research your postal cubby. (I couldn’t help myself) I discovered that Khar, Juhu, Santacruz and Azad Nagar appear to all be in India, ward (think neighborhoods or suburbs) of Mombai, India. I don’t know how it came to be here in the US, but it’s definitely a most unique and well-traveled piece! Love it. How cool and so interesting! Thank you so much for doing that, Stacy, and for letting me know what you found! I love that wooden horse you have – is that a one off or is it available to buy somewhere? Hi Julie. I found my wooden horse at HomeGoods. Here a link to a similar one: http://fave.co/2l3d5eI . Hi Suzy, Thanks for your reply. The link doesn’t work for me sorry, my computer blocks it. I went to HomeGoods & searched for it but no luck there either. Very pretty. I agree – those grey chairs are perfect in there. I love that tone of grey and how you’ve carried it throughout the room. 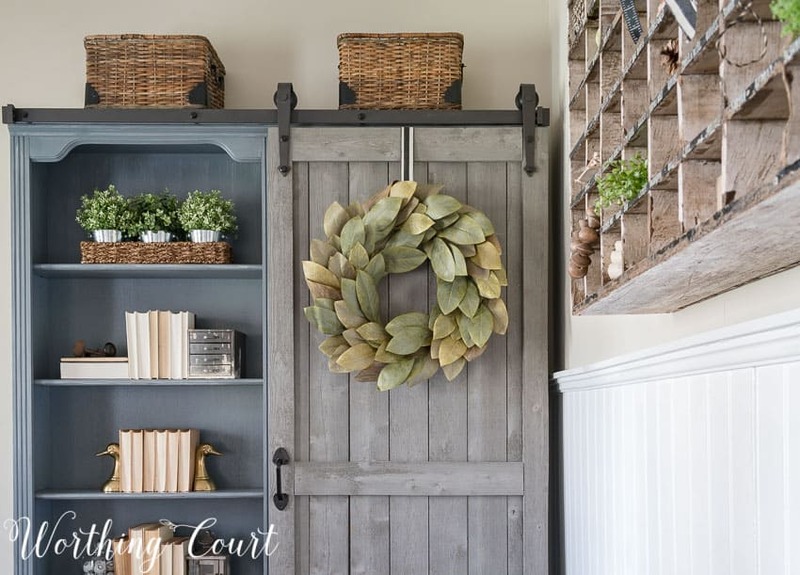 And that barn door on the bookcase – so clever! Absolutely stunning transformation – just WOW! Very very well done, ma’am. BRAVO!!! I love the office Suzy!! Fantastic job on it all. I especially love that storage solution piece!! Sure need something like that. Thank you for the wonderful inspiration!! Working on our home office makeover as I type this comment. 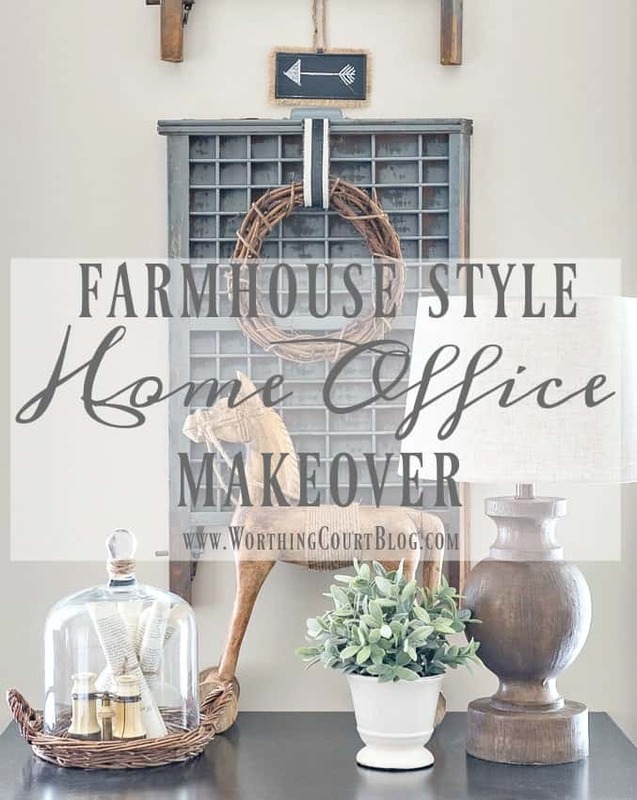 Your ideas give me hope that I too can successfully turn our home office into a farmhouse style office. The office is just beautiful! Love the chairs and that bookcase is to die for!!! I book marked this room long ago. I plan on using your idea for doors on a couple of my own bookshelves. Suzy, this is simply beautiful! 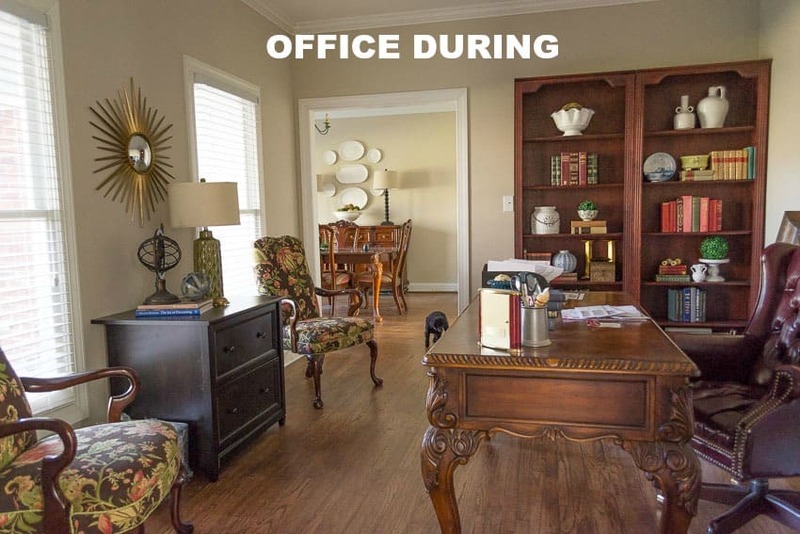 Thanks for sharing the before, during, and after makeover of your home office. It is just beautiful! It was really encouraging to read about your thought processes along the way. The bookcase is amazing! I love the sliding barn door, especially knowing that you took a relatively boring bookcase and made it into something extraordinary. Love the barn door on the book case. Very cool! The barn door on the bookcase is brilliant! Love it! This room is amazing!!! Thanks so much for sharing as this has given me such inspiration for our office which I will be starting on soon. Love the bookcase idea with barn door and your painted bottom part of desk. (we have a similar desk and I had thought of doing this very thing, now I can show the pic to my hubby!) Hopefully I will be as blessed in finding antique wall decor like your postal box. What a find! Again, thank you! I love everything about this home office, the best ever. And what a transformation. I love the colors, the furniture, the decor, ohhhh. 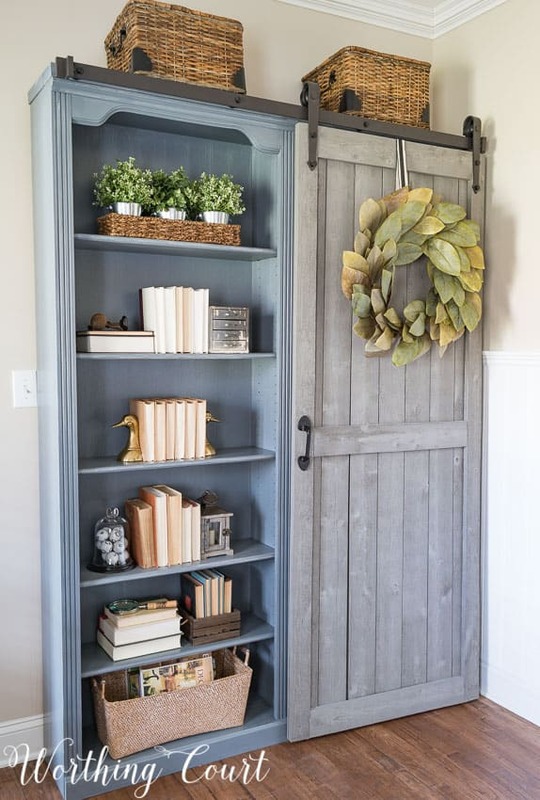 Absolutely Love the bookshelf transformation – two tone paint and barn door. Wow ! The transformation looks amazing! I love traditional and farmhouse style too, and I have been struggled to find inspiration on how to combine the two. You make everything looks so cozy and rustic but still have the elegance of the traditional furniture. 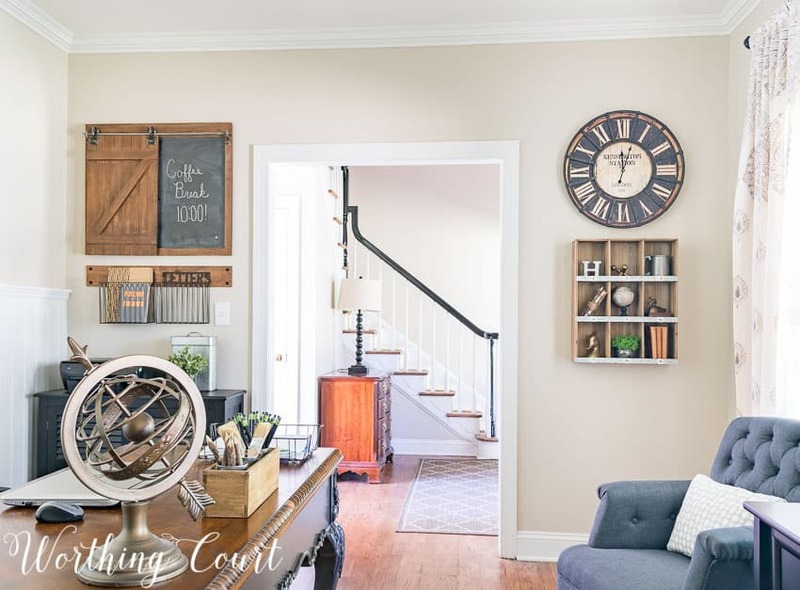 What is the small wall cubby shelf under the clock called? I think it would fit perfectly in an empty spot in our living room. Such a cute transformation! Where are the accent chairs from? I absolutely love how you put your own personality into the farmhouse style. 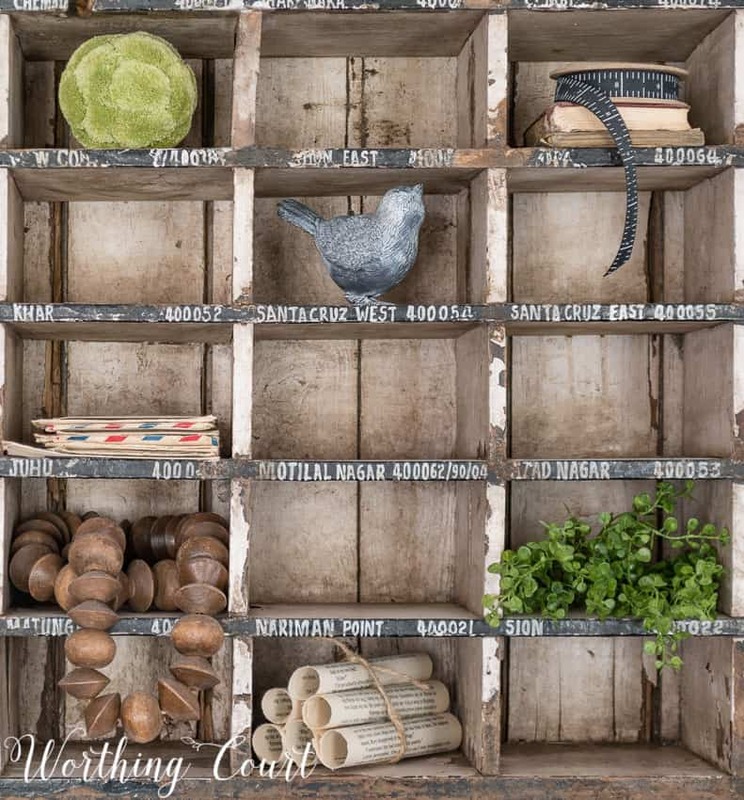 I am in absolute love with the mail sorter…what a beautiful, serendipitous find! By the way, you probably have already researched it yourself but the sorter is from mumbai district in India. Those are town names and the numbers are pin codes. So cool!! That is cool! Thank you so much for letting me know, Barby! Where did you find these chairs? I’ve looked high and low for a chair in this particular color! Thanks! Hi Raquel. The chairs are from Hayneedle and here’s the link: https://rstyle.me/n/c8d4qib7z57 . They’re on sale right now for a great price!